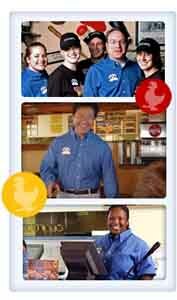 If you are looking for information on the Zaxby's franchise business opportunity, Zaxby's franchises or Zaxby's franchising, then you have come to the right place. We never really intended to have hundreds of restaurants, but a funny thing happens when you have a great idea - people want to be a part of it. And that's exactly what happened to us. Chicken is America's favorite entrée, and the simple idea that chicken can be made fresh and prepared at order received a response that we didn't anticipate. We started out in 1990, and after years of steady growth, we have more than 380 restaurants, with plans for continued quality expansion. Fresh food, attention to detail and a pleasing dining environment have turned out to be a simple but proven secret to success. Like our formula for success, our mission statement is simple: Consistently Create Encore Experiences That Enrich Lives One Person At A Time. Everything we do - beginning with only the freshest ingredients, hand-breading each of our chicken fingers, cutting vegetables for salads and sides each morning, offering a variety of menu items and a range of flavorful sauces - is designed to go a step beyond most restaurants. Everything we do - meals prepared at order, served with a smile, in a fun, upscale environment - is designed to reward customers for choosing Zaxby's. Everything we do is designed to create an Encore Experience - to satisfy our guests in a way that brings them back again and again. Step into the way-back machine and set the dials to 1990. Step into a world where Seinfeld isn't a hit, Starbucks aren't on every corner, and Michael Jackson is the world's most eligible bachelor. But something is missing. There is no Zaxby's. That's because childhood pals Zach McLeroy and Tony Townley hadn't invented it yet. They were still hanging out playing basketball at Zach's, talkin' trash and imagining it into being. They didn't know much about the restaurant business. But they knew this much: the chicken they could find in Statesboro, Georgia, was okay, but not really fresh or zesty. And the local wing joints were good, but couldn't touch the wing joints where they went to school. Plus, none of the local chicken places were fun or had any personality. 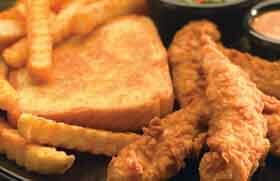 So they dreamed up Zaxby's. Right there. On the basketball court. Between Zach's missed foul shots and Tony's bricks from 3-point land. The rest, as they say, is chicken history. The initial training program is eight weeks long, consisting of a one-week orientation phase at Zaxby's Franchising, Inc.'s training center, three two-week phases at a training restaurant and the final one-week phase back at ZFI's training center. Ongoing support and training updates, in addition to other business development practices - including onsite inspections - are conducted regularly throughout the franchise system. You will receive support that includes real estate guidelines, architectural, construction and engineering assistance. As a Zaxby's licensee, you will be operating an independent franchised business, but you will benefit from being a part of a brand that has exhibited steady growth and success in a wide range of markets across the Southeast. You will be provided with a detailed set of operations manuals, as well as extensive marketing materials. ZFI currently holds semiannual conferences of all licensees, and assigns to each licensee an operations consultant who will make periodic visits to each restaurant to evaluate its operations and make recommendations for improvement.